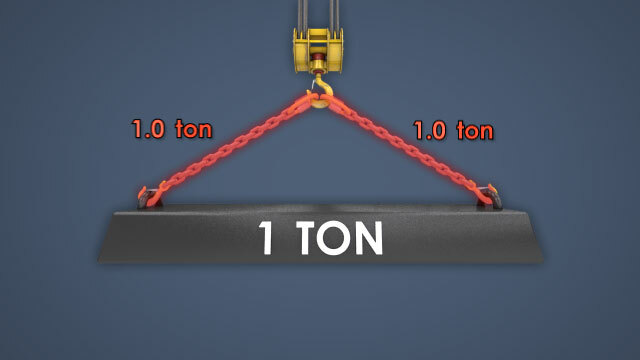 A one-ton load can produce several tons of stress on each sling arm at a low sling angle. When working near people, never allow anyone to ride on a load. Always walk beside the load so that it can be easily seen. This course is intended for Canadian-based companies and individuals and meets Canadian regulations. This course gives workers an overview of the safe operating procedures for moving loads with floor-operated overhead industrial cranes. 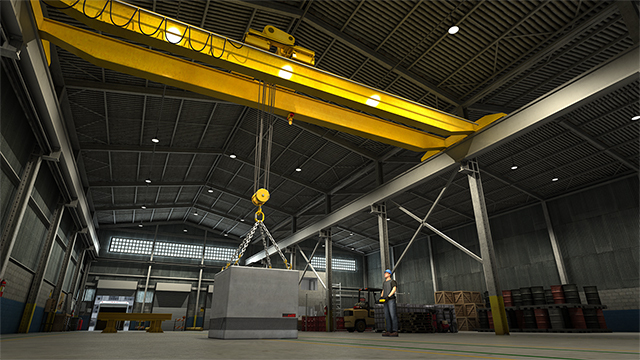 This course covers the dangers associated with lifting and moving a load with an overhead crane, as well as safe procedures that will avoid those dangers. 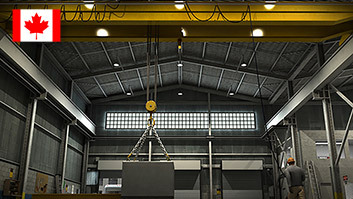 This course is based on relevant regulations for overhead crane safety, as well as recognized general industry best practices. 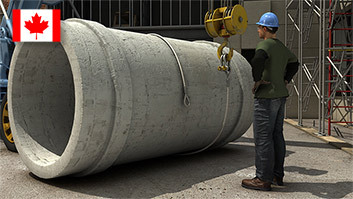 Using clear, concise 2D and 3D diagrams and animations, this training covers the following topics: the importance of knowing the load capacity of the crane and the rigging; how the sling angle can affect rigging; safe procedures for lifting, moving, and setting down a load; safe procedures for operating a crane near people; the importance of personal protective equipment. Why is it important to operate a crane safely? There is great potential for accidents, injuries, and deaths. Every year, crane-related accidents cause hundreds of injuries, several deaths, and millions in property damage. Yes, inspect the crane, rigging, and work area before operating. What is the load capacity? The weight that the crane and rigging can lift safely. Is the lifting capacity greater when the sling angle is higher or lower? The lifting capacity is greater when the angle is close to 90 degrees, and is less when the sling angle is less (such as 15 degrees). Is it important to beware of people when operating a crane? Yes, always. Never operate a crane in a way that might put a person at risk of injury. Lifting a load from the side - this increases stress on the crane and shouldn't be done. What are tips for safe lifting? Make sure the load is stable in rigging, make sure attachments are centered in hook bowl, that safety latches on hooks are closed, and never use the tip of a hook to lift a load. What are tips for safely moving a load? Move smoothly, keep load stable, avoid shock loading, keep load as close to floor as possible, be cautious so slings and hoist lines don't get tangled or twisted, use taglines, and stop periodically during long movements to make sure everything's OK.
What are tips for safely putting down a load? 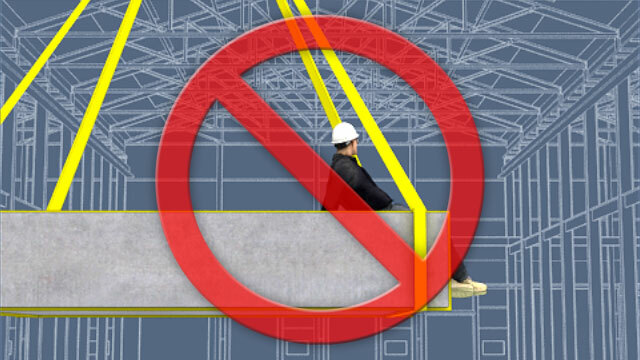 Come to a stop slowly, minimize swinging of load, make sure load is stable, and land the load fully. 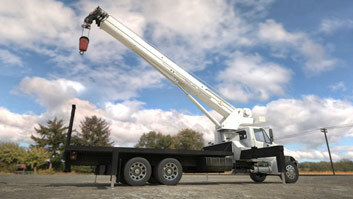 What should you do if a crane or rigging appears to be overload? Tell a supervisor and have a qualified person inspect it before trying to use it again. What are typical members of a multi-person crane crew? Crane operator, tagline holder, signal person, and rigger. It's important that everyone knows their role clearly. What type of PPE should one use? Gloves, steel-toed shoes, hard hat, and other PPE circumstances call for, such as eye protection and hearing protection. Avoid wearing loose, dangling clothes or jewelry. An experienced operator moves the load smoothly. Keeping the load stable and under control is the top priority. Always take your time and move the crane with slow, smooth movements. Sudden movements of the crane either up and down or side to side can cause what is known as shock loading. 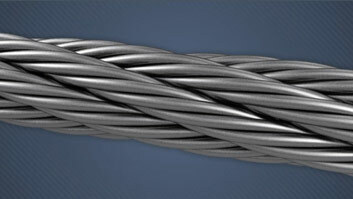 Always avoid shock loading because it greatly increases stress on the crane and the rigging. Travel with the load as low to the floor as possible but make sure you can still clear any obstacles. Be sure that the slings or hoist lines don't become tangled or twisted while moving the load. When walking with the load, walk beside the load so that it can be easily seen. Do not walk ahead of the load. Taglines are lines attached to the load. They may be used to better control the load while it's in motion. For long moves, stop periodically to make sure the load is stable and that the path is clear.